SRI AMMANAA MAHAALL 9282230380 SRI AMMANAA MAHAALL Centralised A/C hall 700persons. , 10 A/c Rooms, Mini hall fully A/c Capacity of 150 persons. Nicely decorated interior. AUSTHETICALLY built,Very spacious stage, Inbuilt Audio, Video & CC TV System, Both sides road approach. Ample car parking space. Next to DAV Girls Senior Secondary School, Annanagar West Extension. Standby Generator & Inverter available. Tie up with Floral Arrangement, Catering Contractor, Video & Photography, Music Parties, Cars/ Travel Agency, Beauty Parlour etc. A/C Marriage hall in chennai Sri Ammanaa Mahaall situated in mogappiar golden george nagar near nerkunrum bus stop in poonamallee high road. Marriage haall fully covered by centralized a/c capacity of 700 persons & and dining hall covered by fully centralized a/c capacity of 200 persons, we are giving 10 .spacious a/c rooms attached bath rooms. with one dormentory, providing kitchen vessels, kitchen amenities and poojai articles. car parking facilities available please contact 9282230380. A/C/Weeding haall in chenaai .Sri Ammanaa mahaall situated in golden george nagar near mogappiar & Nerkunrum bus stop in EVR Salai. It is a centralized a/c marriage haall capacity 0f 700 persons , dining haall also a centralized a/c capacity of 200 persons , and 10 a/c spacious room with bath attached apart from that one big dormentory for stay in the night. with car parking facilities .please contact 9282230380. A/C Marriage hall in chennai. Sri Ammanaa Mahaall situated in golden George near near nerkunram 2 km from koyambedu bus stop and marriage hall capacity of 700 persons and dining hall capacity of 180 persons with centralized A/C & 10 A/C spacious Rooms with bath attached apart from that one A/C dormetory 100 persons can stay in the night , with car parking facilities .please contact 9282230380.
centralized ac hall capacity of 700 persons as seating capacity & centralized ac dining haall capacity of 200 persons at that time.in mogappiar annanagar chennai. 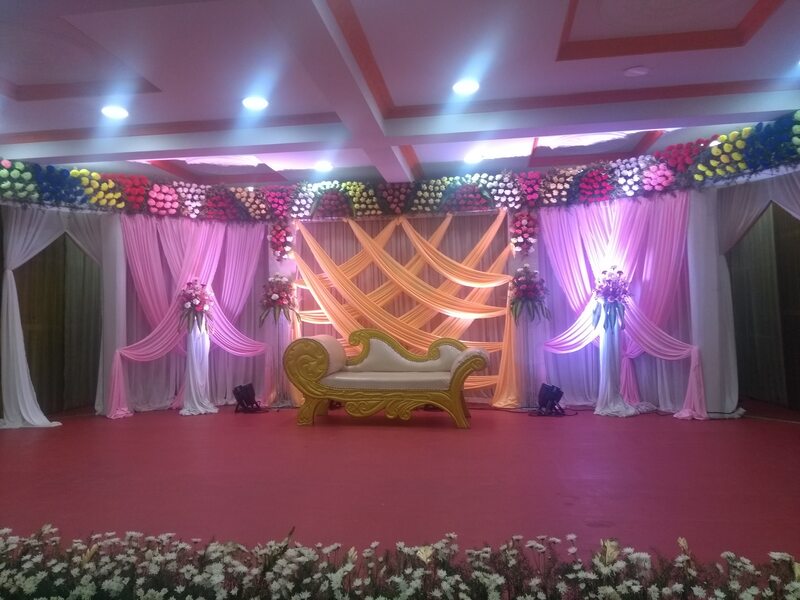 A/C weeding hall in mogappiar east at Annanagar chennai centralized a/c haall capacity of 700 persons and centralized a/c dining haall capacity of 200 persons with car parking and we are doing decoration for manamadai & reception decoration with original flowers in a rich style . please see my website. contact 9282230380 . A/C/Weeding hall in chennai ; Sri Ammanaa Mahaall is situvated in mogappiar in Annanagar it is a centralized a/c hall capacity of 700 persons & Dining hall also centralized a/c capacity of 200 persons 10 a/c spacious rooms with bath attached , & one dormentory (100 persons can stay), is available & we are providing kitchen amenities, kitchen vessels. , car parking facilitiies also avilable.contact 9282230380.